Let’s talk for a minute about the side hustle. In case you haven’t heard the term before, it’s exactly what it sounds like: something that brings in some extra income but isn’t your main job. It’s the thing you work on in between work, family responsibilities and the like. I think that blogging is a perfect side hustle. Read on for my reasoning! You can do it during the in between times. As I type this, I’m on my bus ride home. I have taken to drafting posts during my commute and then finalizing them later at home. 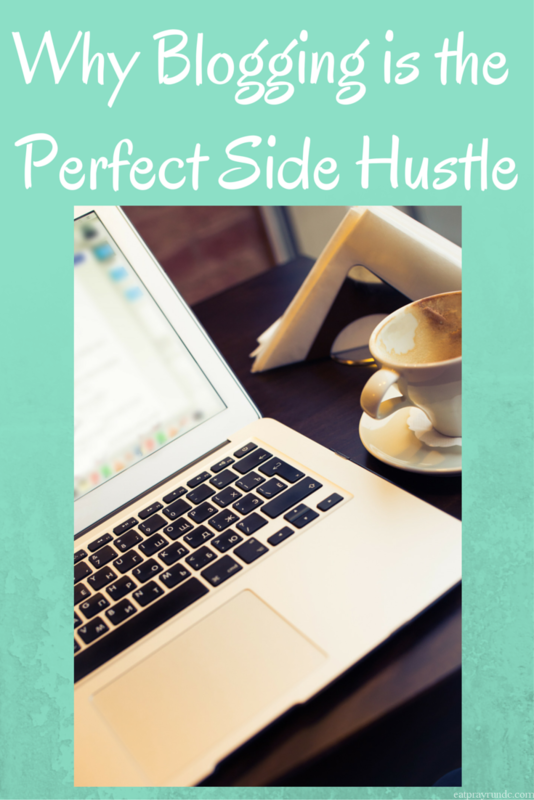 We are all so busy and so sometimes it can be hard to find time to devote to your side hustle. On the bus, in the car (if you dictate your posts – no typing and driving! ), during the kids nap, in the bathroom (hey, no judgment, y’all), anywhere you can take a few minutes. I have the wordpress app on my phone so that I can literally start or edit a post anytime. You can create passive income. Passive income is great. Basically, it’s the crock pot of income – set it and forget it. Ads and affiliate links are the easiest ways to create passive income and make your blog work for you. You can use it to launch another side hustle. If you have a product, a book, a course – really, anything, your blog is a great avenue through which to sell it. I don’t have any products that I sell but if I did, this blog would be a great place to introduce it to all of you all! Share your thoughts – is blogging your side hustle? It’s definitely a hobby for me, and I need to remember that when it threatens to take over all my free time! The business of blogging can be very time consuming, but you do get what you put into it. Yes! (As I write this on my lunch break!) I never want to feel like it’s a chore. To me, that is a sign that I need a break! There are definitely perks to blogging! I have heard of people quitting their full time job to work on their blog full time but in the end went back to work because they couldn’t handle the pressure. If blogging was someone’s only income I could definitely see where it could become stressful! I’ll stick with doing it just as a hobby and collecting any “perks” that come our way! You have a good thing going here Courtney! Like Coco said, I need to remind myself that blogging started as a hobby and that in the long run I’d like it to remain that way. One of the reasons I decided to go into teaching is because I hate the idea of sitting at a desk in front of a computer all day. If my blogging were to become a full time job, I’d be forced to devote more hours than I have to to sitting in front of the computer. That sounds the complete opposite of some of the things that I enjoy most about my full time job, which is the constant interaction with others. Hahaha, well I definitely sit in front of a computer all day BUT working in an office at least now I’m getting up to walk to meetings and such. 🙂 I agree though the lack of interaction would be hard – I found that aspect hard of working from home. Blogging is definitely a hobby for us. While we love the interaction with others and opportunity to try out product occasionally, it is not something we worry about, but rather enjoy it. I would never want to depend on it for income. Agreed that I would never want to depend on it for income – it can be so volatile – that would be so stressful! Yes it’s a great hobby! Important to remember that and not let it take over right?! Blogging is def my side hustle. Everyone is different but for me I enjoy blogging as a business in the sense that I share content specifically for my readers rather than just blogging about my everyday stuff all the time. Everyone’s plan is different but for me I know when my hubby and I think about starting a family and I’m at home all the time I will be happy to already have the foundation of my blog done. Setting up is always the hardest part! I don’t know if it’s my ‘hustle’ yet but it’s definitely my side hobby! I like that I’m able to show my creative side and connect with others. I’ve learned to draft posts in advance and then finish them later in the evenings so it doesn’t take as long and I still have time to unwind! You can use it to launch another side hustle. That is actually hilarious but true. I love blogging and it definitely provides me with both entertainment and as a way to vent various stuggles I go through. Exactly – I love the community and the creativeness and I’ve loved learning about blogging and HTML and stuff that I had no idea about a few years ago! That’s awesome! And sounds like a great plan! Blogging is definitely my hobby even though I spend a lot of time on it. I love that I can have an extension of my PT business by having tabs about weight loss, coaching, etc. on my blog. Totally agree! It’s a hobby for me but enough of a hustle to cover some running expenses and racecations! I’ve been half-heartedly blogging for years but I’ve never really found my groove because of doubt, lack of clarity, and fear over who really cares to read anything I have to write. But I really love to blog and I’m constantly crafting posts in my head, so one of my goals this year is to give it another shot by creating a new one with friends! Totally agree. Sadly, it has become a chore for me of late due to my other obligations and I hate that it feels that way! Right now I have no sponsored posts and I’m blogging during the in between times and that freedom has been nice!